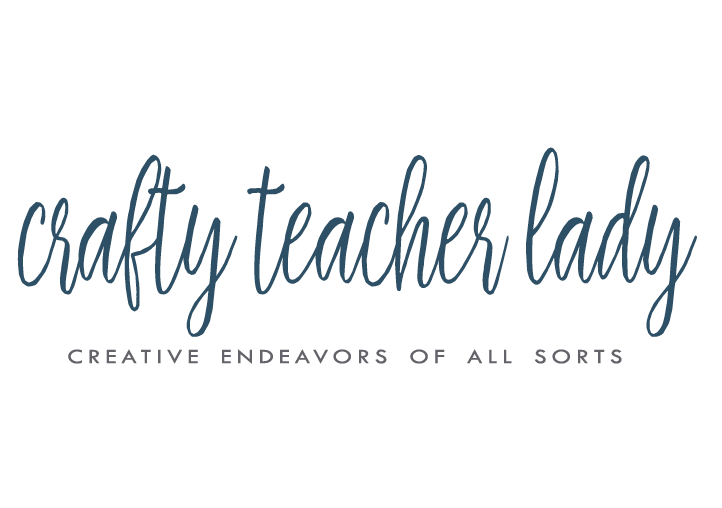 After having over 24,000 views on my first post about classroom organization strategies I've decided to write follow up posts about some other strategies I use to keep my busy high school classroom organized! I've just entered into my 11th year as a high school social studies teacher and have found that lesson planning can be complicated due to the nature of teaching multiple sections of various courses. Hopefully I can shed some light on how I keep my lessons straight for each class! Every high school has a different bell schedule and set up for when and how often teachers see students in any given week. 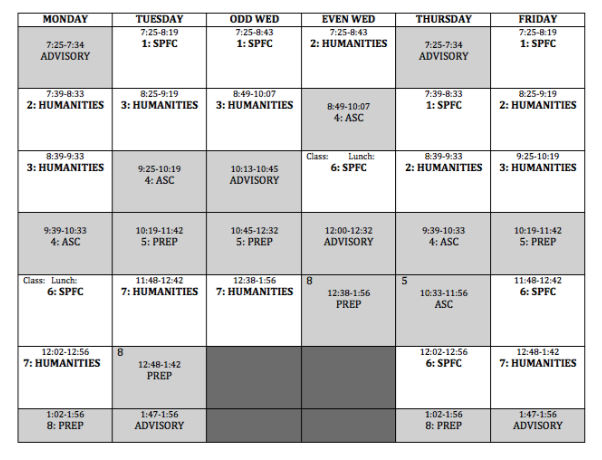 Last year my school went to a hybrid schedule of sorts where we have 8 blocks total, but only see 6 of the 8 blocks in any given day for 54 minute classes, except on Wednesdays where we see only four classes for 80 minutes (and the Wednesdays rotate 'Odd' classes on one Wednesday, then 'Even' classes on the next). Confused yet?? 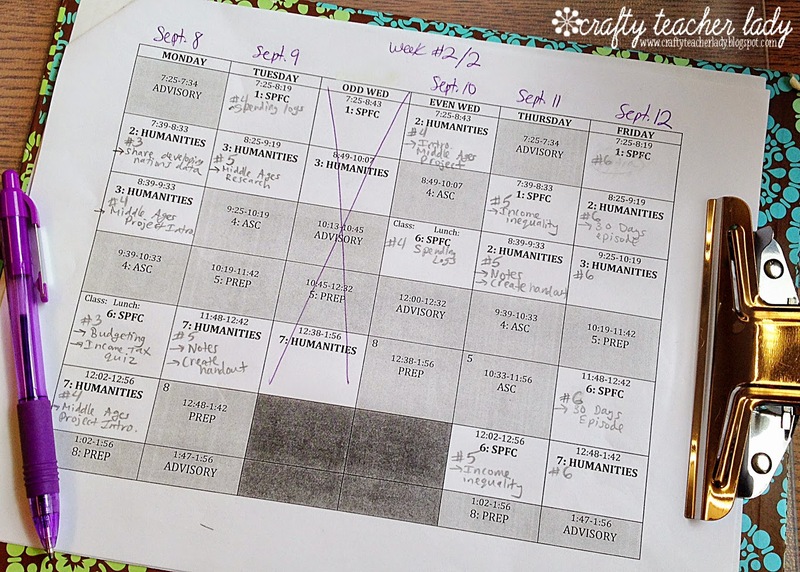 Lesson planning with this sort of schedule can be very complicated, particularly when trying to keep multiple sections of the same course relatively aligned. This semester I teach two sections of Honors Senior Personal Finance & Citizenship and three sections of Academic Sophomore Modern World History (for a total of 5 sections). 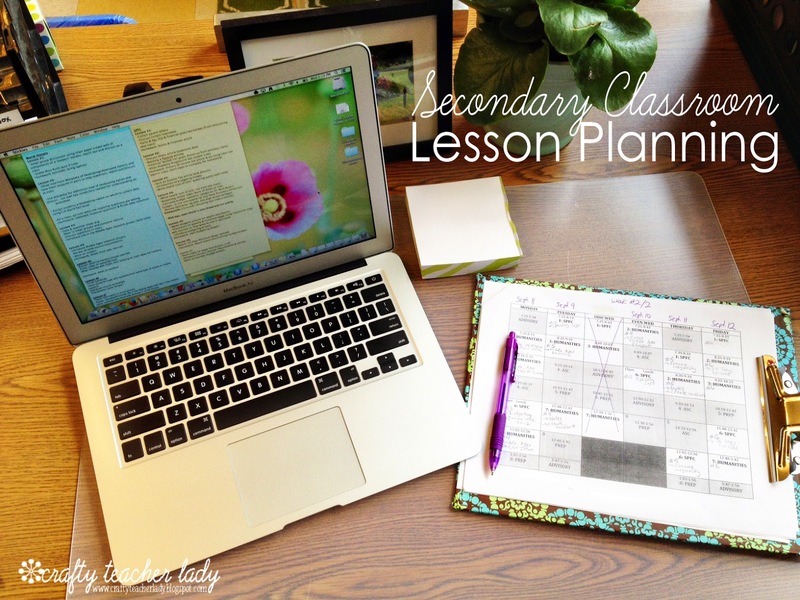 I plan my daily lessons in two week blocks and always ensure that all sections of one course are at the same place in terms of lessons by the end of week two (sometimes I have to build in an extra lesson or activity with one section to have this work out). Because a standard planner wouldn't work, I took our bell schedule and created an individualized version in Word, graying out my prep and duty periods so that I can easily visualize which blocks need lessons. I put the date at the top of each day and whether it's Week #1 or Week #2 in my two-week lesson plan scheme. Often times I'm teaching two or three different lessons on the same day because sections of the same course are at different places (all due to our lovely complicated schedule) so mapping things out on paper helps me keep things in order. On my lesson planner sheets I write only the lesson number and a brief note indicating the topic of the lesson. 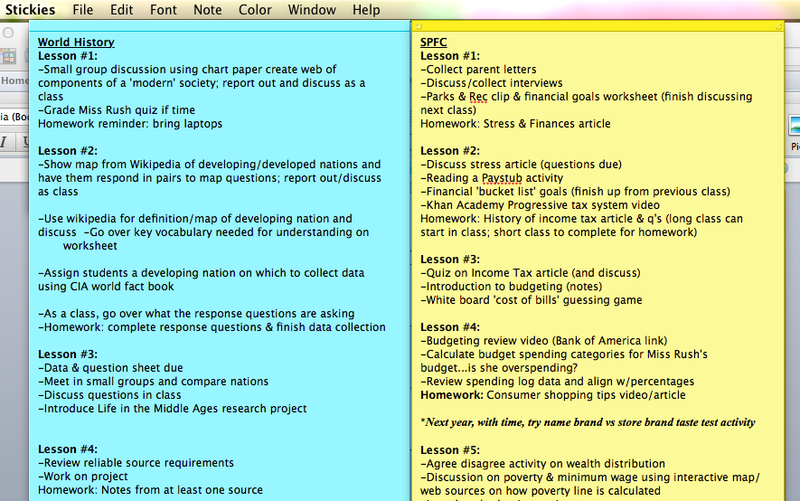 Then, I use the Stickies app on my laptop to write out the more specific details of my lesson plans for each day. I find having my lessons right there on my computer desktop only a click away is very convenient and allows me to make notes and changes very easily. I will often add notes to myself about what to change for next year using italicized fonts on the same Sticky. At the end of every unit, I copy and paste the information in the Stickies to a Word document and save it so I can open it again next year and have a running list of my exact lesson plans. 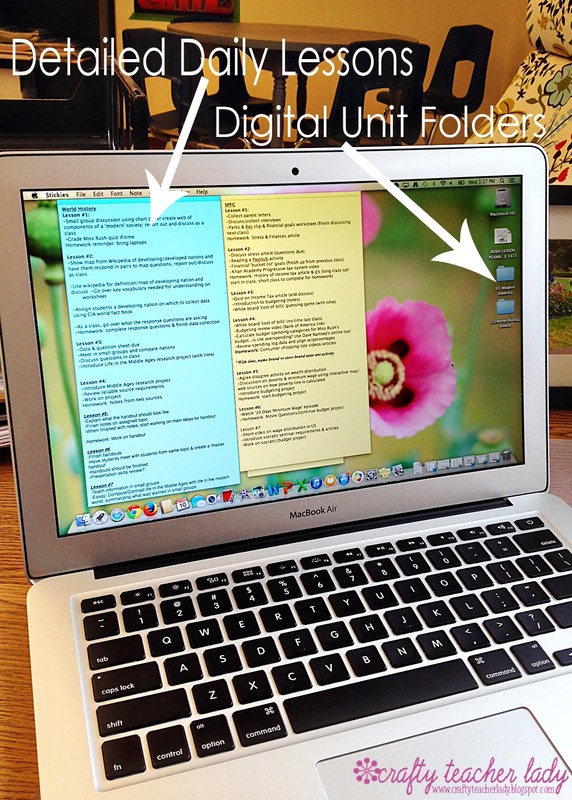 The lesson plans for each unit, as well as all digital copies, links, and resources for the unit, are kept in a digital folder on my desktop. Then the unit folders are 'nested' into a larger course folder. Everything is easily accessed and at my finger tips! I've used the 'Sticky' app for keeping track of daily lessons for the better part of 8 years (ever since being provided with school-issued MacBooks) and it has proved very convenient and easily updated! My next post in the classroom organization series will addressed an issue that plagues every secondary teacher's classroom...ATTENDANCE!! Thank you! I'm glad to see someone address secondary classroom issues. Keep it coming.